Huffington Post Contributor Michael Sitver writes that during the uproar at Milo Yiannopoulos’ event at DePaul last night, Chicago PD officers were not refusing to intervene due to fears of racism accusations, as some had speculated online, but because of a direct order from university administrators to stay out of it. 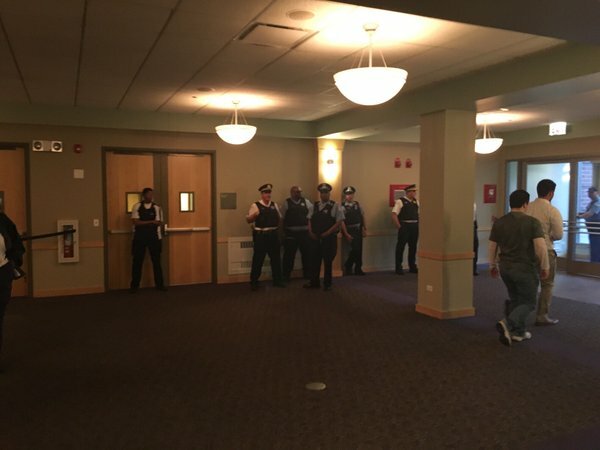 While an invited speaker was harassed and harangued by protesters, DePaul administrators cowered indecisively in a corner. Faced with a serious challenge to first-amendment rights on their campus, they were visibly frightened of confronting the protesters, who tied themselves to the”Black Lives Matter” movement. Administrators had fought against hosting the conservative event for over three months. As they watched the event unravel, they seemed almost relieved to see the radical protesters fulfill their wishes. The rights implications were utterly lost on them. All they wanted was a nice, quiet, homogeneously-thinking campus. Jack Hadfield is a student at the University of Warwick and a regular contributor to Breitbart Tech. You can follow him on Twitter here: @ToryBastard_.